Not to be confused with Hertford or Herford. 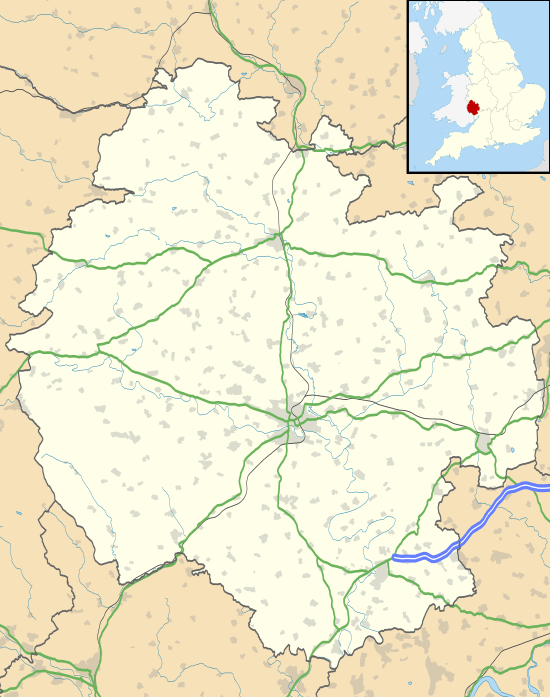 Hereford ( i/ˈhɛrᵻfərd/) is a cathedral city, civil parish and county town of Herefordshire, England. It lies on the River Wye, approximately 16 miles (26 km) east of the border with Wales, 24 miles (39 km) southwest of Worcester, and 23 miles (37 km) northwest of Gloucester. With a population of 58,896, it is the largest settlement in the county. The name "Hereford" is said to come from the Anglo-Saxon "here", an army or formation of soldiers, and the "ford", a place for crossing a river. If this is the origin it suggests that Hereford was a place where a body of armed men forded or crossed the Wye. The Welsh name for Hereford is Henffordd, meaning "old road", and probably refers to the Roman road and Roman settlement at nearby Stretton Sugwas. The Bishop's Palace next to the Cathedral was built in 1204 and continually used to the present day. Hereford Cathedral School is also one of the oldest schools in England. Hereford is served by a 4-platform railway station on the Welsh Marches Line which opened in 1854. Services regularly connect to Worcester, Birmingham, London, Manchester, Cardiff and other settlements in south Wales. The station is currently operated by Arriva Trains Wales. A second station, Hereford Barton, was closed and later redeveloped. A new station is proposed for construction in the government-designated Enterprise zone in Rotherwas, south of the River Wye. RAF Hereford was a non-flying station of the Royal Air Force located nearby to Hereford. It was the home of a wide variety of training schools from 1940 until it closed for RAF training in 1999. Subsequently, the Special Air Service (SAS) moved their base to there from its previous location in the city. There is a clocktower in Hereford where the names of deceased SAS soldiers are inscribed. Many of the schools in Hereford have been rebuilt and improved. The Herefordshire and Ludlow College has also been rebuilt to a 21st-century standard. A new NMITE (New Model in Technology and Engineering) university is also planned, which will teach STEM subjects and is stated to open in 2016. There has also been a number of improvements at Hereford Sixth Form College, where a new business block extension was completed in 2013 and a new reception area was completed in 2015. 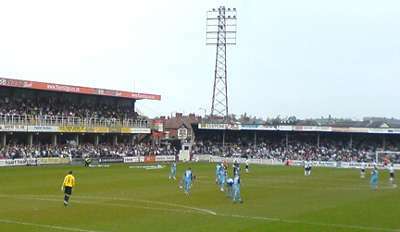 Hereford is the home of the football club, Hereford FC and they play at Edgar Street in the Southern Football League South and West Division. They are a phoenix club that was set up in the wake of the demise of Hereford United Football Club in 2014. United were best known for beating Newcastle 2-1 in an FA Cup replay in January 1972, when they were still a non-league side and Newcastle were in the top division of English football. Other notable city clubs include Westfields and Pegasus Juniors. Hereford has several music clubs/societies such as Hereford Youth Orchestra, a group for those up to the age of 18 which anyone in and around the Herefordshire area can audition for. The orchestra is conducted by both Sir Richard Mynors and Hazel Davies. Herefordshire is one of only three English counties not to have a university. 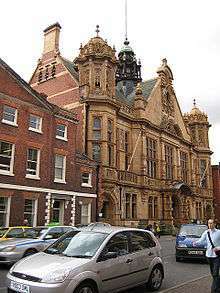 However, until 1977 Hereford was home to Hereford College of Education, a higher education institution which offered teacher training qualifications. Plans are now in progress to create, from scratch, a New University in Hereford, to teach STEM subjects from 2017. Herefordshire and Ludlow College (formerly known as Hereford College of Technology) - The Folly Lane facility includes a university centre for the University of Worcester. The National School of Blacksmithing is the oldest established Blacksmithing college in the UK, also the largest facility for training smiths in Europe. This is also part of HCT. The Royal National College for the Blind – One of the top colleges in Europe for blind and visually impaired students, and one of only two in Britain. The college occupies the former Hereford College of Education campus. The college often plays host to major blind sporting competitions like the Blind World Cup 2010, and currently hosts the England Blind Football squad training camps. The Hereford Academy – A high school for pupils aged between 11 and 19. It was known as Haywood High School in the late seventies until 2006, when it was renamed as Wyebridge Sports College. As of 1, September 2009, It was renamed The 'Hereford Academy'. It has been, like Whitecross High School, re-classified as a 'Sports College'. The Academy's new building opened in September 2011, and the demolition of the old school site, making way for new playing fields to be laid out, was completed in Spring 2012. In early 2008, Herefordshire Council and NHS Herefordshire became the first local authority and Primary Care Trust to form a new kind of partnership. A single chief executive leads both organisations and there is a joint management team and several joined up teams and services, which work as one organisation to plan, purchase, design and deliver care. With the 2001 Foot and Mouth outbreak the market suffered with trade reduced. Established by Act of Parliament, the market had to be provided, and so a Bill was introduced in 2003 to move the site to the outskirts of the city. The inner city site would then be available for redevelopment, a process that has now finished. The local radio stations are Free Radio (formerly known as Wyvern FM) which broadcasts on 97.6-96.7-102.8 FM, Sunshine Radio on 106.2 FM, BBC Hereford and Worcester which broadcasts on 94.7FM. The City is mentioned in the video game Rainbow Six Vegas 2 and in the television show Peep Show. The Hereford Times is the weekly newspaper. The 'Hereford Journal' ceased publication on 11 June 2014. The Hereford admag is a free title, delivered to households across the city and surrounding rural areas. MFA Bowl (formerly known as TGS, home to a Ten Pin Bowling alley and Mini Golf course is located near the railway station. Ellie Goulding, pop singer and songwirter was born in Hereford. 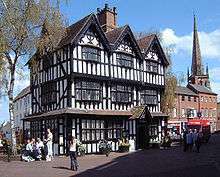 The Hereford Cider Museum is in the City, with a shop, and an interactive guide to producing the drink. It is a registered Charity Trust founded in the early 1970s by people who wanted to record the past, and also the disappearing traditional art of cider making that had been practiced for generations on the farms in the "Cider Counties". Situated in an old cider factory, it opened in 1980 and 1981. In the spring/summer a Cider festival is held, started in the mid-1980s, by the Friends of the Museum with the advice of Long Ashton Research station near Bristol. It has a display of named cider apples, and the apples are pressed in the old way. The Museum holds in its Pomological Archive, a number of records pertaining to apples and cider. Hereford Cathedral dates from 1079 and contains the Mappa Mundi, a medieval map of the world dating from the 13th century which was restored in the late 20th century. It also contains the world-famous Chained Library. Holme Lacy House, now a hotel for a national chain, was built by John Scudamore in the 1500s. It has played host to famous historical figures in its time. ↑ "The Royal Charters of the City of Hereford". Hereford Web Pages. Retrieved 7 September 2011. ↑ "Hereford City Council Charter". Herefordcitycouncil.gov.uk. Retrieved 28 January 2012. ↑ "Coat of arms of Hereford (England)". Ngw.nl. Retrieved 28 January 2012. ↑ "A History of Hereford". Localhistories.org. Retrieved 28 January 2012. ↑ Chester, Jerry (24 February 2014). "World War One: Hereford theatre fire killed eight at fundraiser". BBC Online. Retrieved 27 February 2014. ↑ "July 2006 Maximum". Retrieved 2 March 2011. ↑ "December 2010 minimum". Retrieved 2 March 2011. ↑ "Hereford Times". Hereford Times. 27 February 2009. Retrieved 28 January 2012. ↑ "Fairtrade status given in county". BBC News. 6 March 2005. Retrieved 10 December 2007. ↑ "Bulmers – Getting things ready for 2012 (winter)". Bulmer.com. Retrieved 28 January 2012. ↑ "Special Metals Wiggin Ltd". www.specialmetals.com. Retrieved 16 August 2008. ↑ "Cargill Meats Europe". www.cargill.com. Retrieved 16 August 2008. ↑ "Painter Brothers". www.painterbrothers.com. Retrieved 16 August 2008. ↑ "Bbc News". BBC News. 7 August 2009. Retrieved 28 January 2012. ↑ "Herefordshire College of Technology". Hct.ac.uk. Retrieved 28 January 2012. 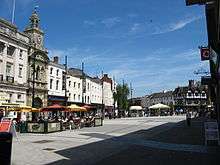 ↑ "Work Starts on Hereford's Old Cattle Market". Herefordtimes.com. 2 August 2011. Retrieved 28 January 2012. ↑ "Stanhope PLC". Stanhope PLC. 5 January 2011. Retrieved 28 January 2012. ↑ "Rotherwas named Enterprise Zone". Bbc.co.uk. 17 August 2011. Retrieved 28 January 2012. ↑ "West Midlands Regional Spatial Strategy". Wmra.gov.uk. 31 March 2010. Retrieved 28 January 2012. ↑ Woodman, Ian (1 September 2011). "Planning permission for new club". Pitchero.com. Retrieved 28 January 2012. ↑ "Hereford Hockey Club". Pitchero.com. 13 October 2014. Retrieved 13 October 2014. ↑ "Hereford: Horse racing returns after four-year absence following closure". BBC Sport. Retrieved 6 October 2016. ↑ "Hereford Skittles Club". Herefordskittles.org. Retrieved 28 January 2012. ↑ "UK Parliament Hansard". Hansard.millbanksystems.com. Retrieved 28 January 2012. ↑ "HCT Rural Crafts Centre". Hct.ac.uk. Retrieved 28 January 2012. ↑ "Holme Lacy College". 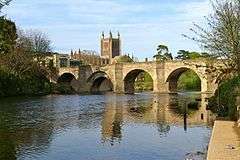 Pershore.ac.uk. Retrieved 28 January 2012. ↑ "Holme Lacy Campus". Hct.ac.uk. Retrieved 28 January 2012. ↑ "Steiner Academy Hereford". Steineracademyhereford.eu. Retrieved 28 January 2012. ↑ "Aylestone School". Aylestone.hereford.sch.uk. Retrieved 28 January 2012. ↑ "The Hereford Academy Official Website". Theherefordacademy.org.uk. Retrieved 28 January 2012. ↑ "The Hereford Academy's New Building". Theherefordacademy.org.uk. Retrieved 28 January 2012. ↑ St. Marys RC High School Archived 2 August 2010 at the Wayback Machine. ↑ "Whitecross High School & Sports College". Whitecross.hereford.sch.uk. Retrieved 28 January 2012. ↑ "Who are we?". Herefordshire.nhs.uk. 11 January 2010. Retrieved 28 January 2012. ↑ "Cattle Market history". Bbc.co.uk. 13 June 2011. Retrieved 28 January 2012. ↑ "Hereford Markets Act 2003". Legislation.gov.uk. 30 October 2003. Retrieved 28 January 2012. ↑ "New Cattle Market". Bbc.co.uk. 16 June 2011. Retrieved 28 January 2012. ↑ "Hereford livestock market move a 'success'". BBC News. 22 November 2011. ↑ "BBC Last Choir Standing". Bbc.co.uk. Retrieved 28 January 2012. ↑ "Music School | Regenerating Hereford City and County". Herefordfutures.co.uk. Retrieved 28 January 2012. ↑ "H.Art Week". H-art.herefordshire.gov.uk. Retrieved 28 January 2012. ↑ Knight, Adam (2014-11-20). "Major ITV drama to be set and filmed in Herefordshire". Hereford Times. Retrieved 2016-02-11. ↑ May, Philippa (2015-12-04). "Tweets lead to publication". Hereford Times. Retrieved 2016-02-11. ↑ Morgan, Ian (14 May 2010). "Bright future ahead for Ipswich Town's Connor Wickham". Hereford Times. Retrieved 16 May 2010. ↑ Emsley, Clive; Hitchcock, Tim; Shoemaker, Robert. "The Proceedings - Ordinary of Newgate's Accounts". Old Bailey Proceedings Online www.oldbaileyonline.org. 7.0. Retrieved 28 October 2015. ↑ "Ordinary of Newgate's Account, February 1721 (OA17210208).". Old Bailey Proceedings Online www.oldbaileyonline.org. 7.2. Retrieved 28 October 2015. 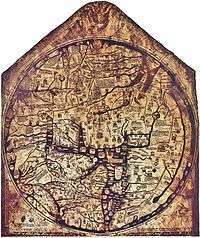 ↑ "Mappa Mundi". 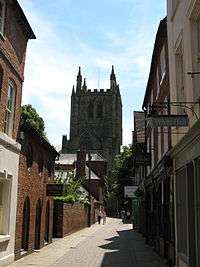 Herefordcathedral.org. Retrieved 28 January 2012. ↑ "Warner Holidays". Warnerleisurehotels.co.uk. Retrieved 28 January 2012.